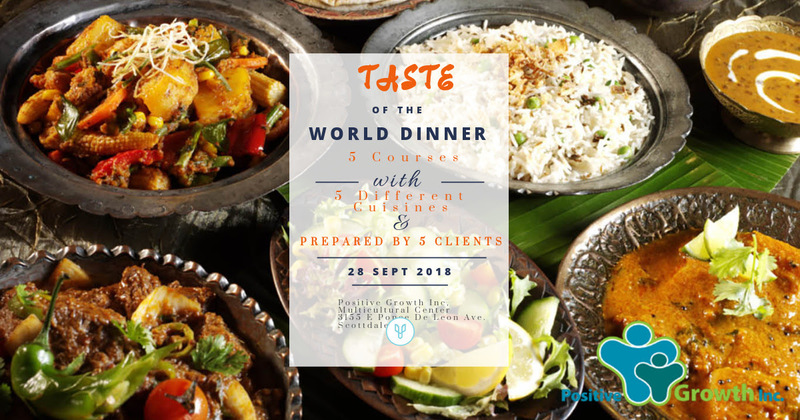 Taste of the World Dinner – Positive Growth Inc.
For a $50 donation, you can join us for a unique fundraiser. You will enjoy a 5-course meal where each dish is prepared by one of our refugee clients representing their native country. You are sure to be delighted by a cuisine experience like none other. The menu for the evening will be revealed prior to the event. You will learn more about the work we do in the community and hear inspiring stories. When you dine with us you can feel good knowing that your ticket purchase is tax deductible and will help fund the work we do with our refugee clients. We are grateful to have the support of Chow Club Atlanta for this event.